Sonor One of a Kind Mango Edition Maple/Beech/Maple Snare Drum 13 x 7 in. This 13x7 in. 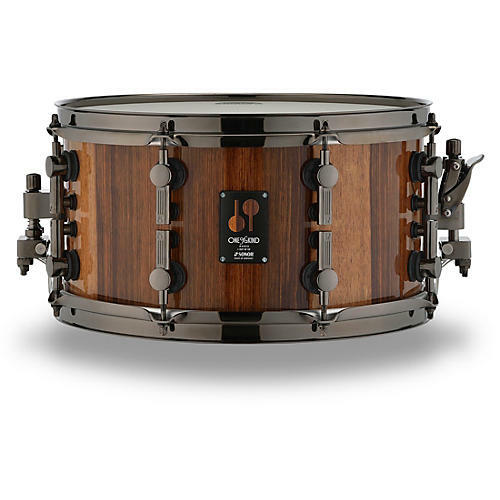 One-of-a Kind Snare Drum is built from a 9-ply 7mm Maple/Beech/Maple Hybrid Shell, with an exclusive Mango inner and outer Veneer. This Mango snare comes with Black Chrome Hardware, 2.3mm Hoops, and SONOR’s Dual Glide Throw Off System. SONOR purchases a single tree, using the whole tree for the veneers used on these drums. These snares represent the finest German craftsmanship that SONOR has to offer. Each drum comes with an exclusive Hardcase with certificate and custom gold key and lanyard. One year warranty on hardware. 2 year warranty on shells.